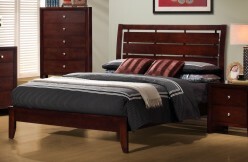 Create a beautiful focal point for your master king bed with the stunning Oleta King Bed. 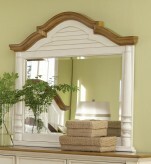 The arched shutter headboard with simple molding and low-profile footboard adds to the classic country cottage style. 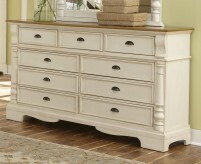 Matching pieces are finished in country white with gorgeous oak-tone tops. Enjoy a calm and tranquil setting while you relax in king bed with a morning cup of coffee with help from the Oleta collection. 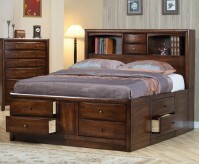 Furniture Nation is proud to offer the Oleta King Bed online. We serve customers across the DFW region including Arlington, Grapevine, Denton and many more. L84" x D89" x H68.25"